For the human body, death is only the beginning. These meat sacks of ours are hothouses of chemicals, and not just the good kind. Pesticides, flame retardants, heavy metals, and other environmental toxins we’ve picked up in life continue to leach into the mortal coil long after we’ve shuffled off. Current cremation techniques don’t help, either. Fumes expelled during incineration are chock-full of carcinogens such as carbon monoxide, nitrogen oxide, and sulfur oxide, not to mention mercury from dental fillings. And let’s not even talk about the ingredients found in embalming fluid. The solution? 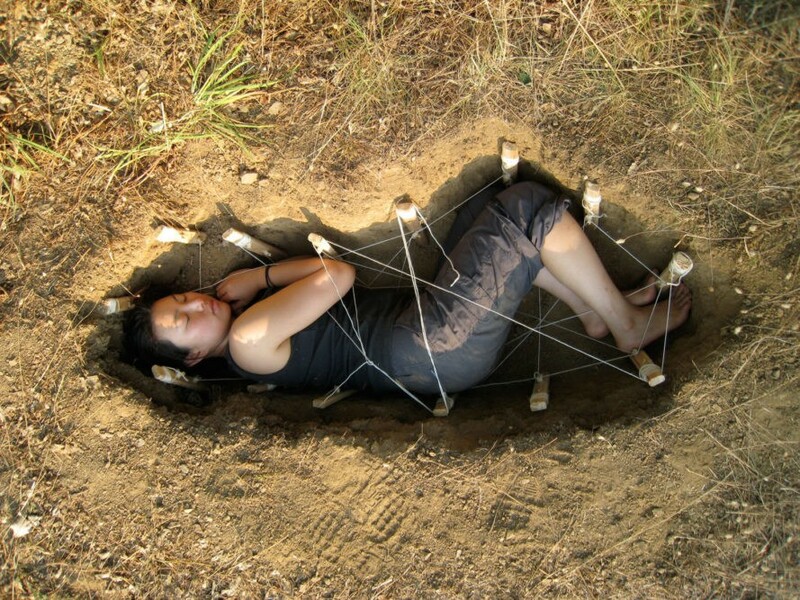 Mushrooms, or more specifically, a mushroom-infused burial suit that accelerates decomposition of the body while neutralizing the pollutants within. In short, it turns corpses into compost. Composed of 100 percent organic cotton, the Infinity Burial Suit is a garment that’s been years in the making. Visual artist and MIT graduate Jae Rhim Lee spent the better part of a decade experimenting with different strains of fungi. By seeding the suit with these mushrooms, Lee is tapping into a documented process known as mycoremediation to degrade contaminants or otherwise render them inert. improve the soil, and enrich plant life,” Lee said. Through Coeio, the company she founded, Lee is already taking orders for the suit, which costs $1,500 and comes in three sizes in your choice of black or natural. Soon there will even be options for pets, from the smallest hamster to the largest Great Dane. “The end result is the most dignified and ecological way to say goodbye to your beloved pet,” Lee said. For the human body, death is only the beginning. These meat sacks of ours are hothouses of chemicals, and not just the good kind. Pesticides, flame retardants, heavy metals, and other environmental toxins we've picked up in life continue to leach into the mortal coil long after we've shuffled off. Current cremation techniques don't help, either. Fumes expelled during incineration are chock-full of carcinogens such as carbon monoxide, nitrogen oxide, and sulfur oxide, not to mention mercury from dental fillings. And let's not even talk about the ingredients found in embalming fluid. The solution? Mushrooms, or more specifically, a mushroom-infused burial suit that accelerates decomposition of the body while neutralizing the pollutants within. In short, it turns corpses into compost.